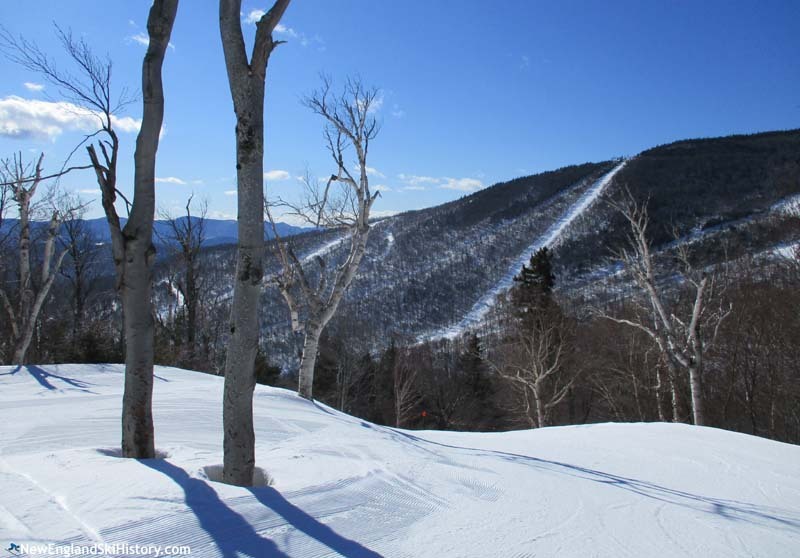 Located deep in the Green Mountains, Sugarbush is one of the largest ski areas in New England by most measurements. The northern peak, Mt. Ellen, is one of the highest peaks in Vermont at 4,083 feet in elevation. While today Sugarbush is composed of two ski areas connected by a transport chairlift, it was originally two separate entities. 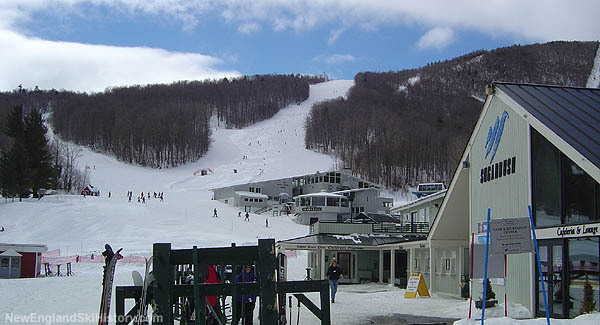 Sugarbush Valley ski area was initially developed on 3,975 foot Lincoln Peak for the 1958-59 season by the Sugarbush Valley Corporation. Former Mad River Glen General Manager Jack Murphy assumed the same title at the new area and was part of an ownership team that also included Damon and Sarah Gadd. Using a $550,000 investment, the group installed a T-Bar and a 9,300 foot gondola covering 2,400 vertical feet, which it billed as the longest lift in the continent and the greatest vertical rise in the east. The ski area debuted on Christmas Day that season. While some ownership groups spend their funds up front and then settle into stagnation, Sugarbush kept the ball rolling as it headed into its sophomore season. A new Carlevaro & Savio double chairlift was installed on a peak located between Nancy Hanks Peak and Cutts Peak. Called Castlerock, the new complex quickly developed a reputation for excellent expert skiing. The Valley House Double was installed for the 1960-61 season, serving three new trails. In addition, the access road to the ski area was rebuilt. 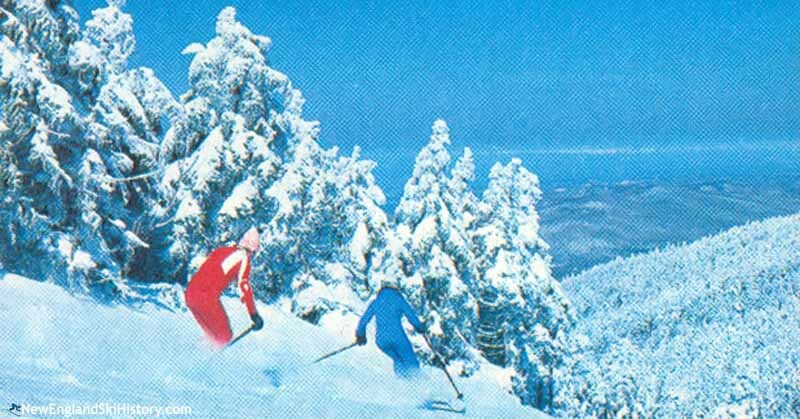 Sugarbush's next big expansion took place in 1963 when the new Gatehouse Area debuted. Served by a double chairlift, the new area took stress off the gondola, while also helping work the ski area closer to a new real estate development. Scores of celebrities vacationed at the resort, giving it the nickname Mascara Mountain. Also that year, Glen Ellen ski area debuted on nearby Mt. Ellen. Taking a not so subtle jab at Sugarbush's greatest vertical rise slogan, Glen Ellen claimed the "Greatest Vertical Descent in East" via its network of double chairlifts. With skiing exploding in the Mad River Valley, development took off as well. According to the Boston Globe, real estate values in the area doubled during the five year period following the debut of Sugarbush. Not to be outdone, Sugarbush took back the spotlight in 1964, when Olympic gold medalist Stein Eriksen was hired to run the ski school. Not only did the ski school attract celebrities wanting instruction, but Eriksen's ski gymnastics entertained onlookers. Wanting a steep fall-line trail, Eriksen designed Stein's Run, which reportedly opened for the 1966-67 season. Sigi Grottendorfer took over as ski school director for the 1967-68 season, as Stein Eriksen departed for Snowmass. That season saw a massive growth in snowmaking capacity, an expansion of the base lodge, and the opening of Middle Earth at Castlerock. 1968-69 was welcomed with the opening of I-89 from Concord, New Hampshire to Sharon, Vermont, making Sugarbush significantly easier to reach from the Boston area. Meanwhile, marketing director Phil Camp promoted a paint-a-gondola contest, which received a reported 4,000 entries. During the winter of 1969-70, a young college student named Winthrop Smith skied in the Sugarbush Valley for the first time. He would return. A new intermediate to expert glade area was constructed for the 1971-72 season, initially served by a 3,000 foot long Pomalift. The North Link area would later be renamed North Lynx. The summit terminal of the gondola was destroyed by fire on December 15, 1972, leaving Sugarbush in a bind. In order to keep terrain open, a snowcat shuttle service was commenced. 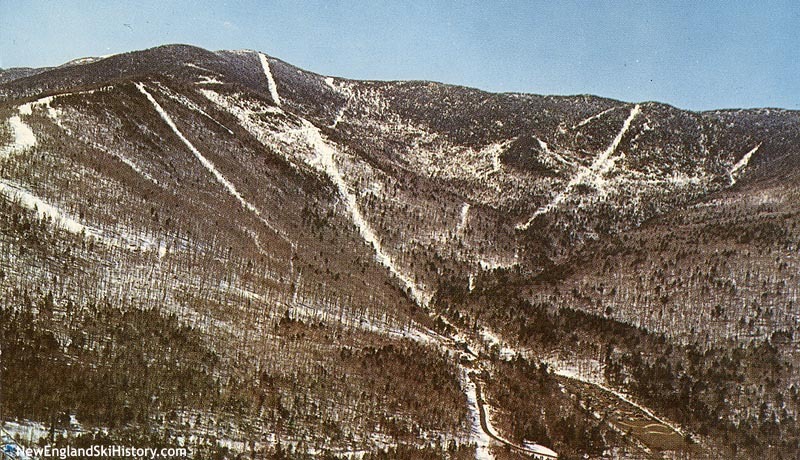 In addition, two rope tows were procured from the Groton Country Club in Massachusetts and installed to serve terrain above the Valley House chairlift, while plans were made to cut the Castlerock Connection to provide alternate access to the base of the upper mountain complex. In 1977, the Gadds sold Sugarbush for a reported $4.2 million to Roy Cohen, president of coin-operated-laundry-equipment supplier Solon Automated Services. 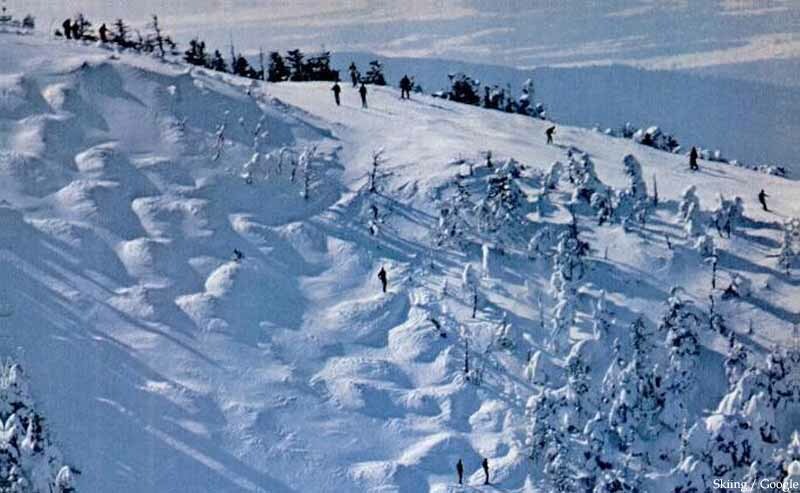 Shortly thereafter, circa the fall of 1978, Solon Automated Services purchased Glen Ellen ski area for a reported $2.4 million and renamed it Sugarbush North. Top to bottom snowmaking was reportedly installed at Sugarbush North for the 1979-80 season. By the turn of the decade, the enormous resort was recording nearly a half million skier visits per year. Initially connected only by shuttle service, the United States Forest Service endorsed a massive expansion campaign in 1982 which would have connected the two areas. The full extent of this proposal was never achieved. Following the 1982-83 season, ARA Services Inc. (the food services company which later became Aramark) purchased Solon Automated Services, with Cohen initially remaining as Sugarbush's CEO. The aging but still famous Sugarbush gondola was removed following the 1983-84 season, replaced with two new Poma triple chairlifts. Following the 1985-86 season, ARA Food Services sold Sugarbush to Claneil Enterprises (a holding company for heirs of Tylenol creator MacNeil Laboratories Inc.) for a reported $14.5 million. Claneil embarked upon the next big lift infrastructure change for the 1990-91 season, as three aging double chairlifts at Sugarbush North were replaced with new Poma quad chairlifts. The Green Mountain Express was Sugarbush's first high speed detachable chairlift. In October of 1994, Les Otten's LBO Resort Enterprises Corp. purchased Sugarbush for a reported $9.1 million. With little time before the season, changes were relatively minor as compared to what was to come. A snowboard park was added on Which Way at Sugarbush North, while backcountry tours of Slide Brook commenced, complete with shuttle bus pick ups from German Flats Road. Meanwhile, after years of stalemate under previous ownership, Otten approached the towns and environmental opposition groups and told them he "needed to connect the mountains, develop a snow-making pond, repair the infrastructure and build a hotel." Moving quickly, the parties were able to find compromises that allowed the projects to move forward. 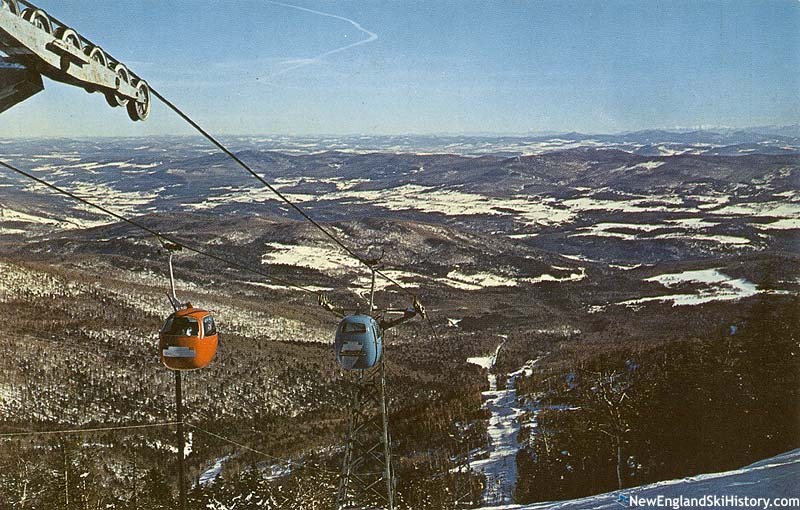 For the 1995-96 season, a staggering four new quad chairlifts were installed at Sugarbush, three of them detachables. Perhaps the most eye-catching of the new lifts was the 11,000 foot Slide Brook Express chairlift, which allowed skiers to go from Sugarbush South to Sugarbush North in only a few short minutes, without having to take off their skis. In addition to the Slide Brook, Sugarbush South saw the installation of its first detachable chairlifts, with the Gatehouse and Super Bravo quads providing high speed service to the lower portion of the mountain. Not only that, but a 63 million gallon snowmaking pond was constructed. Overall, Sugarbush received an estimated $17 million in improvements that year. The following summer, LBO Resort Enterprises Corp. was rolled into American Skiing Company. Large scale capital investments were focused elsewhere. During the 2001 off season, American Skiing Company sold Sugarbush to Summit Ventures NE, Inc., headed by Win Smith (son of Merrill Lynch partner Winthrop H. Smith Sr.). The new ownership wasted no time in improving the area, as it replaced the legendary Castlerock double chairlift that same year. Sadly, only two months after closing on the ski area, Smith's business partner Joe Riemer died suddenly. After finding new minority partners, an inconvenience on Sugarbush North was corrected for the following season. With the relocation of the Green Mountain Express in 1995, the bottom of the mountain was left without a high speed lift. To fix the skier flow, a new Green Mountain Express was installed for the 2002-2003 season, replacing its short lived fixed grip counterpart. With Sugarbush still in the red and large projects on the horizon, Smith moved to Vermont full time and took over day-to-day management of the resort in 2004. 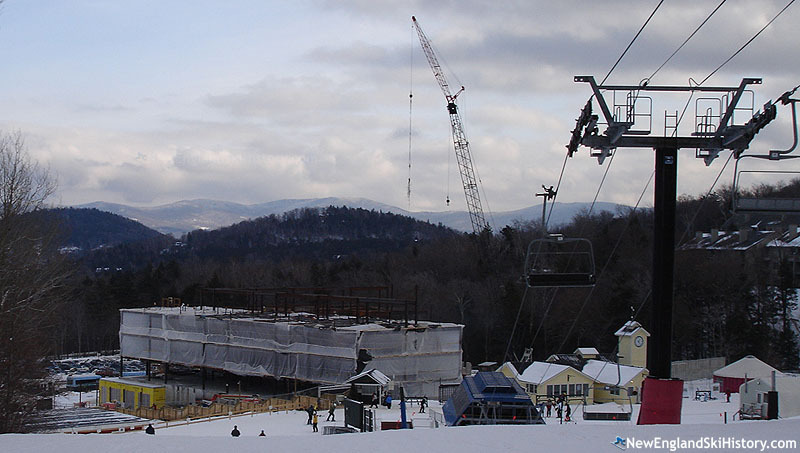 In 2005, work on the Lincoln Peak Village was commenced at Sugarbush South. Phase 1 was completed in 2006 at cost of $40 million and included Clay Brook Residences, Timbers Restaurant, and the Gate House Lodge. In 2007, the Vermont EB-5 Regional Center was rechartered. Under the EB-5 program, a foreigner can invest $1 million in an approved United States business (which must then create jobs), in exchange for a green card. With the Northeast Kingdom labeled a Targeted Employment Area, the minimum investment is cut in half to $500,000, making participating rural businesses such as Sugarbush more attractive. Using this program, Sugarbush looked to find the second phase of its base area development. The aging Valley House Double was replaced with a new quad in 2015, marking the first new chairlift at Sugarbush in over a dozen years. The replacement of old chairlifts continued in 2017, when the Village and Sunnyside doubles were replaced with fixed grip quads. "I started skiing the weekend the resort opened! Several years later as an editor of sports illustrated iwas made ski and travel editor. I commuted every weekend from New York with a ski club bus. I so loved the place that I became a member of Club Ten and bought a condo at Clariere near the nearr the gondola station Over the following years my ski writing career so flourished that I covered World Cup events and Olympic Games including squaw Squaw Valley Insbruck Portillo and Courchivelle-Albertville. By the time I hung up my treasured ski, I had skied 80 Ski areas across the globe and with such dazzling long Olympian champions as Killy, stein eriksen , nancy green, the Mahre brothers ,Jean Vuarnet. It all began on the gentle beginner slope at wonderful sugarbush! Fred smith"
"I remember my amazing mother, Esther J. Shropshire, teaching skiing to hundreds and hundreds of children at the Valley Day Care in the Village. Nice added feature for a daycare! She was riddled with arthritis, yet when she skied, she was so graceful and elegant - you would never even imagine she had any joint stiffness.What a powerful memory to retain from many years ago. (1976 was the year she started teaching there.)" "I remember a family trip to Sugarbush in February 1971 when I broke my leg on the second day of what was to be week long trip. My Dad and I were coming down Middle Earth after lunch and were about halfway down when I turned poorly in some heavy snow and broke my tibia. I remember it seemed like the ski patrol got to me so fast. The ride down on their sled seemed forever. Then I was off to a local doctor's and had a full cast put on and we drove home the next day getting into a pretty bad snowstorm. I felt badly to cut my sister out of a ski holiday ... I skied Sugarbush, Glen Ellen and Mad River for years after ...Best,Danny"